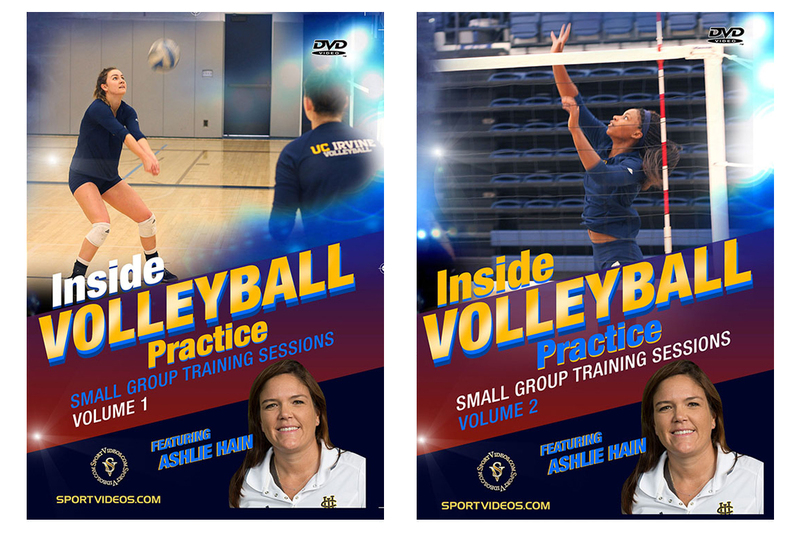 Volume 1 - Get an inside look at a Division I college volleyball practice with University of California, Irvine Head Coach Ashlie Hain. This comprehensive practice session covers positional training with outsides, middles, liberos and setters. Among the numerous skills and drills covered are: middle blocker, hitting, blocking, transition, off blocker, over the net pepper games, defensive coverage, serve receive, setting and much more. This video is an exceptional resource for volleyball coaches or players at any level of competition. 102 minutes. 2017. Volume 2 - Get another look inside a Division I college volleyball practice featuring University of California, Irvine Head Coach Ashlie Hain. The comprehensive practice session covers positional training with defensive specialists, outsides, middles, and setters. Numerous techniques and drills are covered with an emphasis on high intensity repetitions. This video is an excellent resource for volleyball coaches or players at any level of competition.